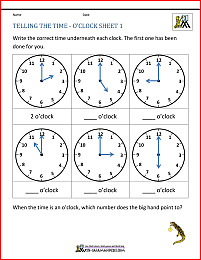 Welcome to the Math Salamanders Measurement Worksheets. 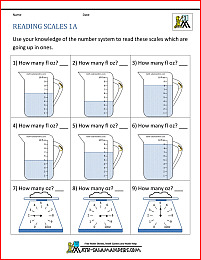 Here you will find links to lots of free Measuring Worksheets pages, which will help your child become more confident reading scales and converting between units of measure. 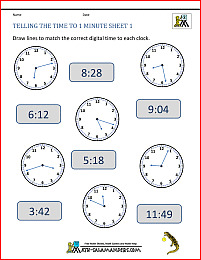 Take a look at our measuring length sheets, or learn to tell the time or convert between 12 and 24 hour clocks. We have it all! 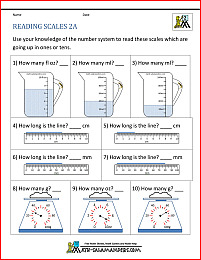 Here you will find our range of measurement sheets involving reading scales and estimating measures. 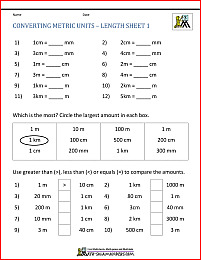 Here is our selection of measurement worksheets for 2nd graders. 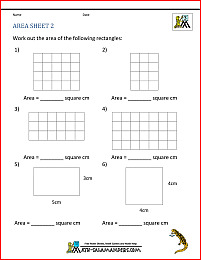 Here is our range of area and perimeter worksheets. All the sheets in the section below support elementary math benchmarks. The sheets in this section involve converting from one unit of measure to another. They include customary and metric unit conversions. Here is our collection of measurement conversion charts. The following charts will help you to convert between units of measure, and also between military (24 hour) and standard time. The following web information page is all about converting standard to military time, and military to standard time. You will find an online chart on this page, as well as some handy printable charts. There is also an online converter to do it all for you automatically! If you want to know how to convert in and out of military time yourself, this is all explained too! understand how to convert to and from military times. You can also try our Military Time Converter which is an online tool to convert to and from military time.